A number of points may be made about this topic. One, which I’ll only briefly mention, is the effort to edit and publish a “chronological” bible, or alternately to offer a chronological study plan. Closely associated with these ideas is an approach to biblical study which some scholars call a “horizontal” reading of the bible. To understand what it means to read the bible horizontally, first consider how one might read the bible vertically. In fact, this is what most of us do all the time. We pick up a book, start at the beginning and read through to the conclusion. This is top-down, or vertical, reading. Should we decide to read the gospels, most of us will read them in the order in which they are found in the bible, and start reading each book from chapter one. Matthew, Mark, Luke, and then John: top-to-bottom, sequential, vertical reading. While this makes a great deal of sense when reading a novel, it may or may not be the most practical way of reading an anthology such as the bible, or of trying to make sense of reports filed by witnesses. When multiple persons are presenting their testimony of an event, it often makes more sense to compare testimony at each important development during the event in question. We seem to intuit this when speaking of a court case, but for some reason many of us have a blind spot when considering the testimony surrounding the events of the life of Jesus. I suspect this is because many of us do not take the time to make a careful study of the gospel accounts. Among those who do, many find a “horizontal” reading of the gospels provides new insights. I personally find a horizontal reading of the bible offers valuable perspective. But we should be aware there are both advantages as well as potential disadvantages in reading the bible horizontally. I find one of the largest advantages in a horizontal reading of the bible is that we are able to contrast and compare specific commentary concerning the same event. Consider for example, the birth narratives of Jesus. Why do they differ? Perhaps one of the most simple observations is found by examining the two (yes, different) genealogies of Jesus. (This is an irreparable break in the inerrant argument, by the way.) In one case, Jesus’ ancestry is traced back to Abraham (see Matthew chapter 1), and in the other all the way back to Adam and then to God the Creator (see Luke chapter 3). I fall into the camp which suggests that in one case Jesus’ ancestry was traced back to Abraham to emphasize Jesus’ Jewish roots, and in the other case to emphasize Jesus’ ancestry as common to all humankind, and related in such a way as to make sense to a pagan of the 1st century. The author of Matthew largely directs his account to those sharing a Jewish-centric view of the world, and is the most closely tied of the gospels to the Jewish bible (what Christians call the Old Testament). The author of Luke-Acts, on the other hand, seems to be addressing a pagan or Roman audience, and wishes Jesus to be understood as closely related to all of humanity. One point which I hope everyone takes from the above observations, is that each book and letter in the bible is written to make a point. And, most importantly, these points differ one from the other. This understanding is really important to grasp. Returning to the birth narrative, reflect upon our traditional Christmas stories. We typically find a manger scene, three kings bearing gifts of gold, frankincense and myrrh, and shepherds in attendance. Yet it never happened; it is a conflation of the various stories found in the bible. Conflation becomes a problem when we no longer appreciate the differences in each account; it becomes a problem when we fail to understand there were a number of ways of struggling with the meaning of the life of Jesus, and instead we just blend all the stories of Jesus -or the entire New Testament, let alone both the Jewish and Christian bibles!- into one averaged-out, homogenized account. A single story, the bible is not! Next I’d like to offer a simple listing of the books and letters of the New Testament, in chronological order. Note that I said “a” chronological ordering, and not “the” chronological ordering. There is always debate about when to date each of these texts. I have offered a rough approximation which I find useful. Be advised, that for my own use and concern, I care less whether 3rd John pre-dated 2nd John, or whether 2nd Thessalonians pre-dated Hebrews. To my mind these are more scholarly debates, and of less practical importance to most persons. Myself included. However, I find it very important to know that a number of the letters attributed to Paul may very well have been written long after his death! And I find it important to know that Mark was the earliest gospel, that Mark was followed by Matthew and Luke-Acts, and that all of these were followed much later, a generation or two later in fact, by the Gospel of John. Furthermore, I find it very useful to know that Luke-Acts is in fact, Luke-Acts: as in Part 1 and Part 2. I also find it very important to know that Paul’s (authentic) letters are the earliest Christian writings we have (although perhaps some of the sayings found in the Gospel of Thomas may be even earlier), and that these pre-date the gospels. For that matter, it is useful to understand that Paul does not seem to be aware of the gospels, nor the gospel writers of Paul’s letters. And we certainly should know that some scholars date the Pastoral Letters well after Revelation (written around 90-95 c.e. by most estimates), and that the Pastoral Letters may be the oldest texts found in the New Testament. At the other extreme are the earliest letters of Paul, written in the 50’s, approximately 20-years after Jesus was executed by the Romans. Paul was himself executed about 67 c.e. so any letter written by “Paul” after this date must be a forgery (a point we will soften by identifying them as pseudepigraphical – more on that below). This is all helpful in developing our understanding of the bible’s contents. We should know that when we read Paul’s uncontested letters, there was no church structure in place. And we should know that by the time the letters of John, the Pastoral Letters, and Revelation were written, there was an established, structured church, at least in a number of cities. And beyond this scope, we should realize all of the writings found in the bible represent proto-church structure. The formation of what we today think of as The Church came about in the 4th century, along with an accepted canon of which books and letters would be included in the New Testament. This is one reason why New Testament authors cannot refer to one another’s texts to determine what belongs in the New Testament: the New Testament did not exist until some 300 years after they were individually, and frequently independently, written. It is not possible that the gospels can be either more or fewer in number than they are. For, since there are four zones of the world in which we live, and four principal winds, while the church is scattered throughout all the world, and the “pillar and ground” of the church is the gospel and the spirit of life; it is fitting that she should have four pillars, breathing out immortality on every side, and vivifying men afresh. And it is not until the 367 c.e. Easter letter of Athanasius, Bishop of Alexandria, that we find the same list of books that are in our New Testament authoritatively presented as having been “canonized.” Several ecclesiastical councils were later held between the years 393-419 c.e. which seem to affirm this canon selection. But these councils did not settle the matter. Up to the 16th century debate continued in some circles regarding the letters of James, Jude, Hebrews, and the book of Revelation. These are some of the reasons I find an objective, historical-critical study of the bible is important in helping us form a more clear and effective understanding of the bible. I don’t take the critical view so liberally as to say there is nothing definitive in the study of the bible, but I cannot take such a conservative view as to say it is all unbiased, factual information; and certainly it is not the Word of God, to be taken literally, as if the New Testament dropped out of heaven as Jesus ascended into the heavens. The truth is far more complicated, and is to be found somewhere between these extremes. As I indicated earlier, one can find other datings for all of these books and letters. Do not assume the list I am presenting is “gospel.” Some alternate arrangements offer logical arguments to support their view, and one should consider their opinions, and weigh them against others as you become familiar with the arguments. After all, no one really knows with certainty who is right. Dating Mark as the earliest of the gospels. Dating the authentic letters of Paul earlier than the gospels. Recognizing there *are* authentic letters of Paul! Recognizing the Pastoral Letters were not written by Paul. Recognizing those letters which presume a structured church hierarchy are very late. Being aware the differences between the gospels offer valuable insights. Knowing the assumption the gospels all say the same thing, obscures their message. These are just a few of the important topics one might assume any one serious about their study of the New Testament must be able to answer thoughtfully. I am not saying they have to agree with me. I am just saying they ought to have considered questions such as these, and come to some logical conclusion regarding how they organize the structure of the bible. After all, the New Testament must have a structure. What is it? Why? 1 Thessalonians…. ( 50.9 to 51.5 ) 51.2 c.e. There is a small point which some may find of interest. There are four styles of literature found in the New Testament: Gospel accounts; Letters (Epistles); one Historical account (Acts); and one Apocalyptic account (Revelation). It is important to remember that when describing Acts as a “historical” account, we do not understand history in the same way as in the ancient world. For one thing, they did not have audio and video recorders so quoting people exactly was not possible. What I find to be a useful parallel is the change in the reporting of television news in the United States. News agencies used to pride themselves on presenting unbiased and balanced reports (whether or not they met this standard is a separate question); whereas, newscasts are now first and foremost entertainment, and their main objective is obtaining viewer ratings (for the advertising income). We might think of our apprehension of history as the former, and the ancients as the later. Not that they meant it as entertainment, but meaning there is a very different standard of accuracy and objectivity in the last 100 years as opposed to the 1st century, when writing historic accounts. Meaning in the Greek, falsely inscribed, or bearing a false title (pseud- false, pretending, or unauthentic; epi- upon, on, over, near, at, before, after; and -graphos (something) drawn or written). In our context this means that an author of an ancient book or letter claimed to be a person they were not, someone famous, in the hopes their work would be read and afforded serious attention on the strength of the claimed authorship. Some make the argument pseudepigraphy (forgery) was common place and accepted in the ancient world. There are certainly many ancient claims to the contrary. The ancient Roman physician Galen found the practice objectionable enough he wrote a book on how to tell if a book claiming to have been written by Galen actually was written by Galen. My opinion is that forgeries were not widely accepted as harmless, desirable, or a means of attributing affection. This last case is sometimes an exception. There are students of famous philosophers who are known to have written in their teacher’s names, claiming their ideas really were born of their teacher rather than themselves. Perhaps. But outside this small circle, forgeries would seem to be undesirable. In an entirely different category are anonymous works. In such writings the author never makes a claim to be any specific person. All four of our canonical gospels fall in this category. A hundred years or more later these writings were assigned by Church tradition to have been authored by the famous persons whom we now commonly associate with them (Mark, Matthew, Luke, and John). The book of Hebrews is also an anonymous work; it is our earliest surviving example of a Christian sermon. There was a lot of debate about whether or not to accept Hebrews into the canon, but since it was thought to have been written by Paul, it eventually made it into the New Testament. Almost all scholars now accept Paul is clearly not the author. But it is not a forgery (pseudepigraphical) because the author never claims to be Paul. Then there is the case of John, the author of Revelation. He claims to be John, and there is no reason to think otherwise. However -and this is a big however- there is no reason to think he is John the Apostle either. Modern scholarship now assigns the authorship of this apocalyptic text to a man named John of Patmos. There are a few observations I would like to make regarding the authorship as assigned by modern scholars. The first point is a reminder these assignments are debated. Some more so than others, but one must understand nothing is 100% certain in this area of study. Unlike the study of physics, we cannot run empirical experiments to determine who wrote which books, and have these results repeated and verified by other researchers. This is why physics is a “hard” science and the study of religion is a “soft” science, like philosophy and psychology. Paul wrote seven (7) undisputed letters. 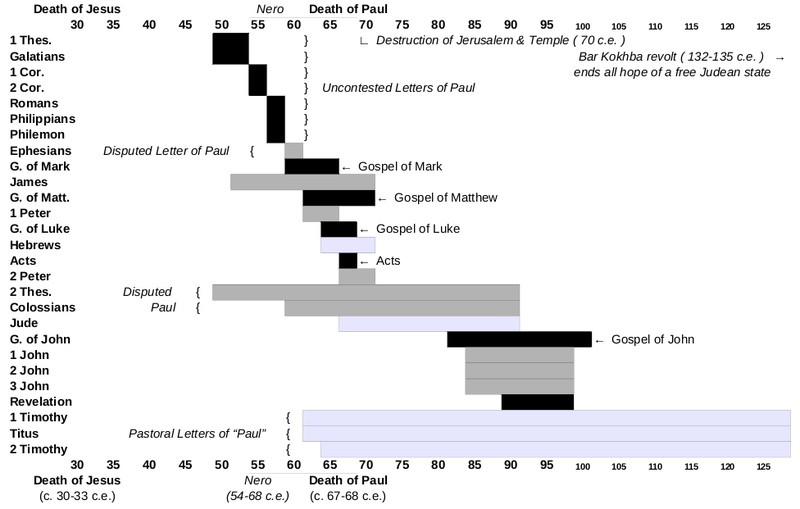 Three more are disputed, while almost no credible scholar believes Paul wrote the remaining “pastoral” letters. Personally, I only consider Paul to have written the uncontested letters, as I find the arguments against his authorship of the disputed letters to be convincing (vocabulary, structure, etc). And, as mentioned previously, very few scholars believe Paul wrote the book of Hebrews. Paul is obviously a very important influence in the early Christian church. He certainly wrote 7 of the 27 books of the New Testament (fully one quarter of our New Testament). And his “school” of thinking clearly influenced another three books, and possibly three more in the Pastoral Letters. However, I would discount the Pastoral Letters because I believe the argument may be made these are of such different character they are better understood to be authored by a different school of thought. At best it is a much later development in the Pauline school. But no matter how one divides the authorship and rates the relative importance of this collection of writings, it remains one of the largest contributing influence upon the New Testament anthology. I view the collection of writings attributed to the school of thought surrounding John to be of two sources: the Gospel of John, and the letters of John (1st, 2nd, and 3rd). The Gospel of John was written anonymously, although attributed to the “most beloved” disciple; most scholars offer John as the most likely candidate. Modern scholarship finds it highly unlikely that John, or any of the other disciples, wrote any books or letters in the New Testament. While it is theoretically possible John lived long enough, and became rich enough, to afford a classical education and learned to write Greek, and to write it poetically, it remains extremely doubtful this is the case. However, many scholars do believe there is a person around whom the writings attributed to John relate. So in this sense, the Gospel of John and the letters of John, are assigned to the Johannine Community or the School of John. The Gospel of John offers some of the most beautiful poetry in the New Testament. It also presents the highest Christology – Jesus Christ as Divine before the foundation of the earth itself. This is the source of Jesus’ “I Am” statements. I personally find this gospel to carry a flavour which reminds me of the Hindu Upanishads, and I find these to be some of the most appealing and spiritually moving passages of the New Testament. However, there are also darker passages. I am speaking of those occasions when “the Jews” are spoken of in a negative, accusing manner, giving the reader the impression the “Jews” were against Jesus. I have two main difficulties with this presentation: Jesus was himself Jewish! ; and clearly, a number of “the Jews” sided with Jesus! One theme seen in the Johannine collection is that of separation. I find the best way of understanding this collection, is as a reflection of the times (of the late 1st century). I see the polemic speech in the Gospel of John as indicative of a change in the population of the Jesus Movement, away from the Jewish population, to the gentile population. In the letters of John, we see a break within the Johannine community itself, where certain persons form their own church, because they hold a different understanding of what it means to follow the teachings of Jesus. But holding different understandings of what it meant to be a follower of Jesus has always been present in the New Testament. In the authentic letters of Paul we see an early separation from the Jewish Jesus Movement, toward the gentile population. A decade or two later, and independently, we find differing understandings of Jesus are struggled with in the early gospel accounts. A few decades later, the letters of John, and the (pseudepigraphical) Pastoral Letters of Paul, are representative of the continuing proto-church development in late 1st century. As I read this progression, we see the earliest shift in the authentic letters of Paul, and the latest shift in some of the Johannine collection and the Pastoral Letters. I personally find these late letters as more informative of these changes in perceptions of self-image of the developing proto-church, and less critical from a theological perspective. But I am biased, of course. I find it difficult to take theological instruction from authors who denigrate women and label those who disagree with them as antichrists. As mentioned earlier, the book of Revelation was in fact written by “a” John, but this is now understood to be John of Patmos, and not the John who is the author of the Gospel of John (and neither of these authors is John the Apostle). This is a reminder that Revelation is best thought of as in its own category of writing, and not group in with the writings of the Johannine school. The synoptic gospels are collectively one of the most important collection of books in the New Testament. For obvious reasons – they offer the earliest testimony of the meaning of the life and ministry of Jesus. They are called the synoptic gospels because they relate very similar stories about Jesus and his ministry. Synoptic means seen or viewed together: from the Greek, syn “together” and opsis “view.” They share a great deal in common with one another, and are quite different than the Gospel of John. According to the best modern scholarship, none of the gospels are thought to have been written by the person to whom they are attributed. As is normal, some people disagree, of course. But for the most part, such persons either have not attended seminary, or attended a seminary which does not teach the biblical discoveries of the 150-years or so. Most scholars place Mark as the earliest surviving gospel, followed by Matthew and Luke-Acts. Whoever wrote Luke also wrote Acts; as observed previously, these may be thought of as Parts 1 and 2 of the same account. Most scholars also believe that Mark was a primary source for Matthew and Luke-Acts, in addition to a lost text named Q (short for Quelle, which is German for “source”). The authors of Matthew and Luke-Acts added their own material to their respective text, but they also heavily borrowed from earlier writings. There are other theories, but the Q-theory and the derivative nature of Matthew and Luke-Acts is the most widely accepted. All of these, in turn, later impacted the writing of the Gospel of John, but to a lesser degree. Because Mark, Matthew, and Luke are so closely related to one another, they receive most of the attention of those reading the bible horizontally. However, there are similar comparisons which are made between the authentic letters of Paul and Acts. Acts, as compared to Paul’s authentic writings, would seem to sometimes attempt to smooth over the image of Paul and how closely he worked under the authority of the disciples, such as Peter. In cases of discrepancies, I tend to side with Paul’s account. How might one make use of the chronological view of the New Testament? The very first thing I would suggest is to just sit with it for a while. Print the chronological list, and stick a copy in your bible. Reflect upon the story of Jesus, and specifically what each book and letter considers most important. Note what changes take place over the 100-years or so following the execution of Jesus. There is an underlying progression, and distinct changes, both in geography (Paul and the author of the synoptic gospels did not know of one another’s writings; the Jewish Jesus Movement was more important near Jerusalem, and Gentile Jesus Movement more important elsewhere) and in their understanding of how Jews and Christians relate to one another, and of the ontology (essential nature) of Jesus’ Christology. The term “Christology” refers to the study of Christ. (The word Christ, derives from the Greek, christos, meaning “anointed one.”) This area of study investigates questions of theology surrounding the Christ-hood of Jesus: preexistence; eternality of Christ; Hebrew prophecies about the messiah (which in Hebrew, also means “anointed”); the ontology of Christ’s humanity & deity; incarnation; temptation; sinlessness; death; resurrection; ascension; ontology of the Trinity; and more. “Low” Christology relates to Jesus as primarily or entirely human; “High” Christology relates to Jesus as primarily or entirely Divine. Such are the highlights of my thoughts regarding the chronological study and reading of the New Testament. I feel we must be careful when doing so -so as not to conflate what should otherwise stand on its own- but for the most part, I do find this to be a valuable approach. In many ways it is part and parcel of adopting a modern historical-critical review of the biblical texts. And for my part, I find this clearly adds to my understanding of the texts; and I like to believe it also adds to my apprehension of the meaning underlying the texts. Where you read black, I read white. But first one must discern the black from the white.